Your nonprofit's website is the hub of all things related to your organization. From conveying your mission to securing donations, your nonprofit website serves a variety of purposes, and strategic design can help facilitate all of them. To put together a site that's effective as well manageable down the line, you can work with a website builder or content management system (CMS). A website builder can provide you with the tools you need to create a beautiful, fully functional site that your donors will have no issue navigating. And best of all, you don't have to be a development expert or web designer to end up with a professional, high-quality site! While anyone can use these website builders to get started with their site design, keep in mind that there are some elements of web development and design that are best left to professionals. Once you've decided on the best site builder for your needs, make sure you're partnered with an experienced nonprofit technology consultant to help you maximize your website's potential! Choosing a consultant who's well-versed in your CMS can help you discover smart ways to customize your design, enhance your content, and ensure that your site visitors don't encounter any hiccups when surfing your site. Ready to find out which nonprofit website builder can push your organization's online presence to the next level? Let's dive in. A popular content management platform for individuals, businesses, and nonprofits, WordPress is remarkably user-friendly considering its extensive functionality and flexibility. Whether you're an expert coder or a web design novice, WordPress can be a manageable solution for your nonprofit's website and content management needs thanks to its wide range of features and simple interface. Price. With a variety of pricing options (including a free basic package for nonprofits just getting started) and plenty of inexpensive or free themes to choose from, WordPress is a scalable solution that can meet a range of needs. Plus, you'll be able to stick with WordPress even as your web development goals evolve. Usability. One of the simplest site builders around, WordPress strikes a balance between usability and functionality. Because the learning curve for WordPress is somewhat less steep than other site builders, your nonprofit won't have a problem building or maintaining your site yourself. Adaptability. WordPress empowers your organization to customize your content management system to create a platform that fits all of your website needs. Both small and large nonprofits can find WordPress a manageable choice not only to fulfill your nonprofit's website needs, but to enhance your supporter engagement strategy through your online presence. Don't let WordPress' user-friendliness fool you—this website builder can do a lot! To really get the most from WordPress's many features, your nonprofit should work with a web development consultant with specialized nonprofit experience, such as the ones highlighted in this helpful post from DonorSearch. Keep in mind that like the other site builders we highlight, WordPress wasn't built for nonprofits, so you'll need to know how to use it in a unique, nonprofit-specific way. A knowledgeable nonprofit consultant can help you navigate the backend of WordPress to build out your site in a way that drives donations and increases supporter engagement. 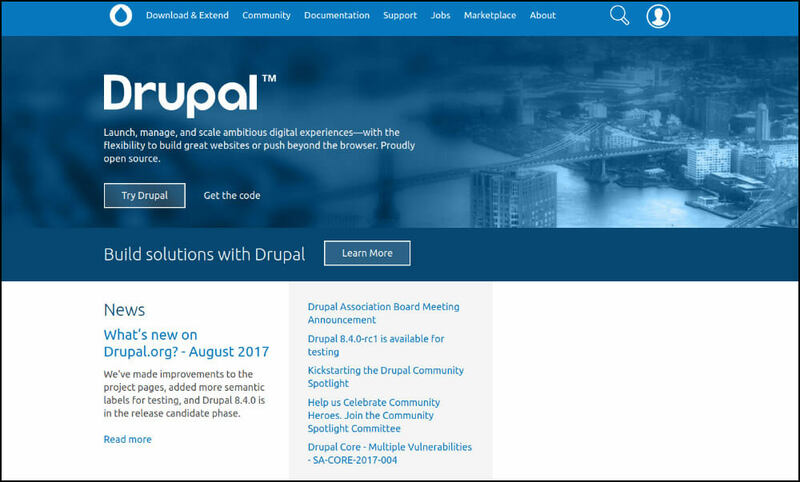 One of the most dynamic content management systems available for nonprofits, Drupal is hard to beat for organizations looking to build out a truly unique website. As an open-source platform, anyone can download and contribute to Drupal, making it a collaborative, creative choice. If you need endless options for your site development, read on—Drupal may be the best site builder for you! Customization. Drupal is an ideal choice for large-scale nonprofits with complex needs, as this CMS enables complete customization. If drag-and-drop site builders aren't giving you the flexibility you need, consider investing some time into building out your site using Drupal instead. Universality. Drupal prides itself on being a communal platform. With so many nonprofits already using Drupal to manage their websites, there are a plethora of online resources for organizations like yours to take advantage of, including pre-made modules and distributions that you can add on to your CMS. Scalability. Because it has so many customization options, you can count on Drupal to meet whatever needs your nonprofit has, now or in the future. Your organization won't have to switch content management systems if you decide you need to make extensive modifications; Drupal is scalable enough to meet your organization wherever you are, no matter how ambitious your goals are. Drupal has a steeper learning curve than the other website builders on this list, but on the flipside, it's also one of the most high-powered CMS options on the market! If your nonprofit wants a website that's customized to fit your needs precisely, Drupal might be the way to go. Just make sure you're partnered with a Drupal-savvy development team who can work with you to turn ideas into realities. Otherwise, you might be left with endless potential and no way to reach it! Designed specifically to address the digital needs of nonprofits, Morweb is among the strongest CMS options on the market. With user-friendly drag and drop page building capabilities, fully functional pre-built themese, and personalized migration, strategy, and support services, Morweb ccan be a perfect partner for your organization's next digital project. Intuitive themes. Morweb's popular prebuilt themese contain ever element your nonprofits needs to get its site up and running fast. Plus, all the layouts are compeltely customizable. Drag and drop templates and widgets make it easy to get exactly the site you need without extensive or time-consuming coding. Built-in SEO tools. Search engine optimization is the key to driving more traffic to your site, attracting more donors and partners with every piece of content your publish. Morweb's built-in SEO tools make it simple to add the metadata and custom URLs that drive search engine resultes. Customizable modules. Add a powerful module to your Morweb site with the click of a button. Add ecommerce tools, donation forms, event management tools, even member directories. Morweb dramatically simplifies the internal digital operations that previously required multiple separate software solutions! 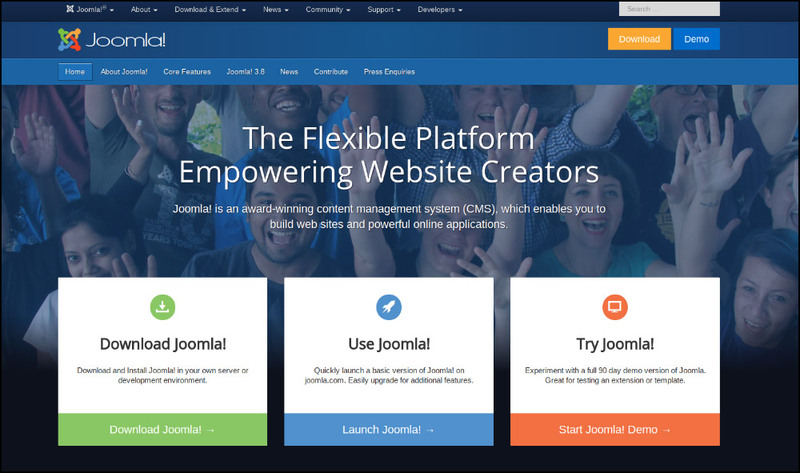 Joomla is a free open-source content management platform that powers millions of websites across a variety of sectors and industries. With a simple interface and more flexible backend development options for experienced users, Joomla doesn't make you sacrifice powerful functionality for ease of use. Simple frontend editor. No coding knowledge? No problem! Joomla offers an incredibly easy frontend editor that makes creating and updating content a breeze without any advanced development skills required. Easy organization features. Joomla understands that the best nonprofit websites are easily navigable ones. You can use Joomla's tagging and content categorization features to keep your content well organized and easy to find. Advanced extensibility. If you're not getting enough from Joomla's core features, you can scale your CMS using any of the 7,500+ extensions available! Most are free to download, so you can build out your perfect content management system without breaking the bank. For almost 20 years, Blogger has maintained its reputation as one of the most reliable lightweight blogging platforms and content management systems available. This user-friendly site builder is most useful for nonprofits with straightforward blogging needs. Though Blogger may not be able to offer the robust functionality of more complex CMS options, you can trust that your staff will be able to manage content easily and efficiently! Easily designable templates. If your nonprofit wants to get your site up and running quickly, Blogger offers a number of templates that you can use as-is or customize to meet your site's needs. Quick analytics tools. Site traffic and engagement are important metrics for nonprofits to track, and with Blogger, running reports on your site's progress couldn't be easier! You can use their built-in Google analytics tools to see how well your blog or website is performing. Multi-user management. Chances are, multiple members of your nonprofit's team will need to access your site's backend at one point or another. Blogger makes it simple for everyone who needs to create or edit content to do so using their multi-user management tools. With beautiful design options and ultimate ease of use, Typepad makes professional-quality web design a reality for smaller organizations who need a website solution fast. Typepad offers thousands of pre-built templates as well as the option to build and customize your site from scratch, giving you as much control over the look and feel of your content as you want. Since it's so simple to use Typepad, your nonprofit can launch your site with as little downtime as possible. On-the-go publishing options. Whether you're posting content via email or on your mobile device, Typepad provides some of the most versatile publishing options to ensure your website is always accessible. Customized support. Unlike some site builders, Typepad has no free pricing option. While that might seem like a downside, keep in mind that what you're really paying for is unlimited, personalized support from their expert staff. That's something you won't get from every CMS vendor! Built-in social discovery tools. To help you promote your content, Typepad comes equipped with social sharing tools that make it easy for you to get the word out via all the available social media platforms. They even have a Typepad Showcase page on their website that features their favorite blogs in every category! Building your nonprofit's website might seem like a formidable challenge, but with these website builders, it doesn't have to be! With the help of these platforms—and of course, the right nonprofit web development team!—you can put your mission at the forefront of your digital presence, highlighting your cause and driving donations. Top Nonprofit Websites. Kickstart your design by learning from the best! These nonprofit websites can inspire your team as you launch your own website, and you might even learn a few tips and tricks you haven't considered. Top Nonprofit Website Design Companies. Double the Donation has the scoop on who can help make your nonprofit's web development dreams come true. These firms are all uniquely qualified to help your organization build out a killer site, so read Double the Donation's reviews to find out which design team is the best fit for you. Nonprofit Web Design Tips. You've got your website builder and have partnered with a top-notch design firm; all that's left is to get to designing! Before you do, read up on the top tips and best practices for nonprofit web design, as compiled by the experts at Double the Donation.